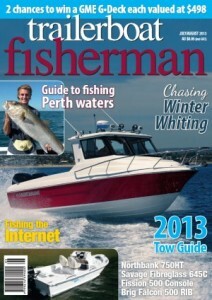 Fission 500 - In The Press | Shannon Boats. Boat Builder in Taree. See details on the Fission 500, Kayaks and Pulling Boats. make ‘glass boats lighter yet stronger than a tinnie’. The problem is cost and it’s the reason we haven’t seen much appreciable change in the way fibreglass boats are built in 30 years. When Nigel Shannon of Shannon Boats set about creating his first fibreglass hull he didn’t follow conventional design ideas. He took full advantage of the complex shapes that fibreglass can be moulded into and created a design that appears very unusual but is one of the best fishing platforms of its length I’ve ever tested. Measuring 5.0 by 2.3 metres, the 500 is very beamy for its length. But what really sets it apart from conventional deep vee ‘glass hulls of this size is the hull tunnel running either side of the bottom. The tunnels are wide at the bow but taper towards the transom and – assisted by the deep chines outboard with spray strakes – trap air compressed at their entrances and create additional lift aft. As the tunnels narrow, the flat bottom at the centre of the hull broadens forming a very wide planing plank. Combined with a sprung sheer and buoyant bow, the result is a hull that has plenty of buoyancy when nosing into a slop or running downwind, yet has an incredibly soft ride into a chop when planing. And because of the broad planing plank the hull floats in around 12cm of water, enabling it to get into shallow areas that would be inaccessible to a deep vee hull. The demo hull I tested was also the prototype and although of foam sandwich construction it weighed 350kg; about 100kg more than the eventual Fisson 500 models produced for sale which will have resininfused, foam sandwich hulls. As Nigel uses the prototype with a Minn Kota bow mount trolling motor in addition to the main engine, the foredeck has a mounting pad to accept this, although a bow roller could easily be fitted if required. Aft of the pad is a stainless steel cleat either side which is through-bolted to the gunwale. The foredeck is part of the deck moulding with side decks wide enough to sit on, and production boats will have non-skid panels moulded in. The raised, carpeted forward casting platform has a socket for a swivelling bucket seat on spigot and four storage compartments with hinged lids. Just aft of the bow is the anchor locker and behind this a huge storage locker flanked by a smaller locker either side. A cut-out in the aft end of the casting platform enables a centre console to be fitted and either side of this beneath the platform deck overhang is space for an 80 amp/hour deep cycle battery. Being a tiller steer model, the prototype had two plastic rod holders where the console would fit, but these could be incorporated into a Targa top over the console if needed. The main floor runs full width of the hull and right aft to the transom and is fully self draining. Ahead of the single outboard well with direct motor transom mounting is space for a live bait compartment, and the sockets for the helm and passenger seat aft were well positioned in relation to the multifunction tiller arm of the two-stroke Yamaha 50 fitted. Outboard of these seats was a low stainless steel grab rail either side and a through-bolted stainless steel cleat was fitted to each transom quarter. stall once during extensive idling periods between the performance trials. Spinning a well-used alloy prop of what appeared have a 12 inch pitch, the Yammie planed our 700kg total displacement at 13.7kt according to my handheld Lowrance GPS, and averaged 23.7kt at Wide Open Throttle. When the throttle was opened fully from trolling revs the hull reached maximum speed in just ten seconds! Through full lock figure of eight turns at two thirds throttle no prop ventilation occurred and the hull cornered almost flat. Good thing the aft grab rails were there! Apart from its soft ride over our own wake at WOT, what really impressed was the low wash from the hull. This was thanks to the deep, narrow chines aft which concentrate wash in the tunnels and not outside the hull. And despite the low topsides, no spray came aboard at any time from running into or across the low river chop. Back at the well-appointed Manning Point ramp (just across from Harrington), Nigel was able to drive the hull back onto the overengineered prototype custom trailer, which uses Teflon skids and a shaped, carpeted wedge for the hull bottom. The hull sits low on this trailer where the tunnels are over the wheel mudguards and the chines atop the outer trailer frame. As tested on this trailer with the Yammie, a full fuel tank, ground tackle and safety gear, the towing weight is around 850kg. But on a slightly lighter custom trailer production hulls will weigh in at around 700kg, eliminating the need for potentially troublesome trailer brakes. Nigel’s 2.4 litre petrol dual cab Nissan Navara had no trouble towing the prototype boat. The standard of finish was excellent with no moulding flaws, good lustre in the gel coat and solidly-mounted fittings. Production hulls will be rated to take four-stroke outboards such as Yamaha’s FT60D, but as tested with a two-stroke Yamaha 50 and on a custom trailer the package price will be around $30,000.